First, a big thank you to everyone following my blog. Here’s some stuff I’d like to share in no particular order. During the tedious processes of inviting people to our wedding, my fiance and I began a running joke of inviting Stephen Colbert. Well, he may still be joking, but I’m not. We don’t have terminal illnesses or a terribly romantic love story–unless you consider our burning desire to have Stephen Colbert at our wedding an illness and online dating terribly romantic. (1) Like us on Facebook. (3) Get your friends to do the same! Thanks in advance for the help, internet – you’re so awesome! Make to checkout all the other info ozgrid has to offer! Looking for a cool Excel forum? I am a contributor to the Excel forum, Excel Heros on LinkedIn. This forum is associated with the terrific Excel Hero website. I have a lot of strong feelings about visualizations as you may have noticed in a previous blog post. I believe that many organizations, including the media, software companies, and even universities are encouraging meaningless and distorted data representations. The visualization guru, Stephen Few, has this excellent quiz to test your Graph Design IQ. Check it out! Right now, I’m reading Few’s book, Now you see it, which I highly recommend. A link for it will be up later on an “excel resources” page when it’s complete. 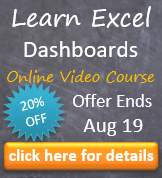 Want to hire an Excel consultant, but don’t know where to begin? This page from Daily Dose of Excel is a good place to start. As you may have noticed, sometimes my blog updates are sparse. I do this in my spare time and sometimes I’m just too busy to update. Part of the problem is I start writing tutorials that always become too big. For example, I wanted my sensitivity analysis tutorial to be complete in one post — already, it might grow to three or four! I have a real problem. Do you like writing? More specifically, do you like writing on Excel? Want to join forces? I would really love to have some more regular posts. Drop me a line if you’re interested! Have just one post you think you might want to share? Again, drop me a line! Comment below, email, facebook, twitter, LinkedIn… whatever you want. Have something interesting? Share it! This entry was posted in Data Visualizations, Discussion, VBA on May 20, 2012 by Jordan G.